Collection of six action adventures from the Marvel Studios. In 'Iron Man' (2008) Tony Stark (Robert Downey Jr) is the billionaire owner of Stark Industries, a corporation that specialises in weapons development. When Tony is kidnapped by terrorists in Afghanistan, he is made to construct a devastating weapon. Instead, however, he builds a high-tech suit of armour and uses it to escape from captivity. When Stark discovers a conspiracy that could have serious repercussions for the whole world, he uses his new invention to try and stop the villains and save the world. In 'The Incredible Hulk' (2008) scientist Bruce Banner (Edward Norton) searches for the cure to his life-transforming alter ego. Scouring the globe, searching for the antidote that will prevent him from changing into The Hulk, Banner is forced to keep a low profile, lest the military authorities that seek to exploit his powers finally catch up with him. In an ironic twist, he longs to be with the only woman he has ever loved, Betty Ross (Liv Tyler), who just happens to be the daughter of his chief military adversary, General Thaddeus 'Thunderbolt' Ross (William Hurt). Having finally decided to return to civilisation, Banner discovers that there's an even bigger and more dangerous enemy on the block - The Abomination (Tim Roth). A primal beast even more powerful than The Hulk, this new foe, the result of a foreign agent being exposed to an even larger dose of the radiation that created The Hulk, is unable to revert back to human form. Now the stage is set for a titanic battle of the two heavyweights, with New York the setting for the ultimate showdown. In 'Iron Man 2' (2010) Downey Jr reprises his role as Tony Stark, the billionaire industrialist also known as armoured superhero Iron Man. With the world now aware of his dual identity, Stark faces pressure from the government, the press and the public to share his technology with the military. With his secretary Pepper Potts (Gwyneth Paltrow) by his side, Tony fights to protect his suit by forging new alliances and confronting powerful new enemies. 'Thor' (2011), moving between present-day Earth and the fantastic realm of Asgard, tells the story of the mighty Thor (Chris Hemsworth), a powerful but arrogant warrior god whose reckless actions rekindle an ancient feud among the deities. There, he falls in love with scientist Jane Foster (Natalie Portman) and, as the darkest forces of Asgard are sent to invade Earth, he eventually learns what it means to be a real hero. In 'Captain America: The First Avenger' (2011) Chris Evans stars as Steve Rogers, a volunteer for a top-secret military research project who signed up after being deemed physically unfit to enlist in the U.S. Finally, in 'Avengers Assemble' (2012), Nick Fury (Samuel L.
Jackson) and the international S.H.I.E.L.D. agency must act swiftly to form The Avengers, a team of ultimate superhero defenders, when Earth comes under attack from Loki (Tom Hiddleston) and his multi-faceted army. 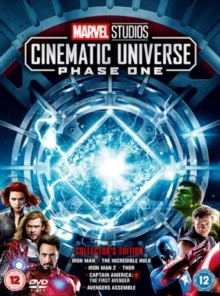 This all-action supergroup comprises Iron Man, Thor, Captain America, The Black Widow (Scarlett Johansson), Hawkeye (Jeremy Renner) and The Hulk (Mark Ruffalo) - but will their combined powers be sufficient to overcome the formidable Loki and save the Earth from the clutches of evil?